In most schools today, new and good, solid teachers are left to work largely alone, meet infrequently, and rarely get clarity about which teachers are achieving better student learning—and whose opinions and methods might best guide collaborative groups on strong instruction. Teachers working in schools without great leadership and without very strong professional learning communities are being robbed of the opportunity to achieve the higher level of success with students of which they are capable. Yet collaboration and opportunities to develop remain at the top of most teachers’ wish lists. 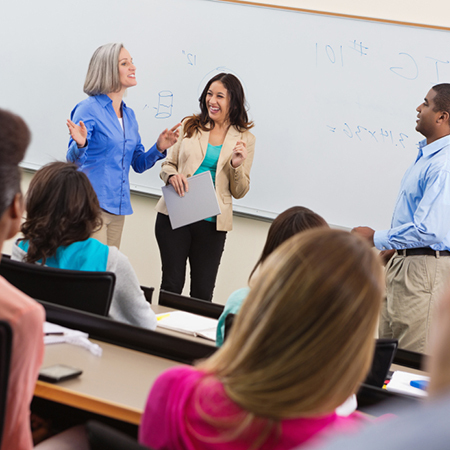 The U.S. spends significant sums on teacher professional development that has little impact, but often great development is readily available down the hall—if more teachers could lead and develop their peers. Meanwhile, many highly effective teachers would like to share their successes with peers, grow their own instructional prowess, and advance in their careers without leaving teaching. Their peers need these teachers to become peer leaders. Peer leaders can lead job-embedded professional learning during school hours that is part of everyday school work. Leading development as part of instructional planning and practice allows advanced teachers to improve others’ work and their own, expanding their impact on students and peer teachers, without leaving the classroom. These teacher-leaders must have training and development themselves, time to plan and collaborate with peers, and school administrators’ support to ensure that professional learning is part of everyday teaching. Teacher-leaders should lead the great majority of professional development in schools, and should be paid and empowered to develop excellence among teaching peers. In all cases, teacher-leaders responsible for developing the instructional practice of other teachers must work collaboratively with others and, in most cases, should continue to teach as well as lead. Our goal is to help teachers and their schools, unions, and districts implement collaborative, job-embedded professional learning that leads to better student learning by developing and using the skills of involved teacher-leaders. Build Capacity: Develop/collect content and process guidance to achieve teacher-led professional learning, pulling together the work of others and adding our own work and advice about how to achieve greater implementation of teacher-led professional learning. Build Awareness: Build awareness among teachers within each of our purviews to demand and lead job-embedded professional learning. Implement: Implement in schools, directly or by influencing others, while catalyzing additional implementation by others.